Specifically designed to balance comfort with weight savings, the Ergon GS1 has become the ultimate marathon grip. Its two internal supports are individually tuned for perfect rebound and control, and the lightweight Direct Control rubber ensures ultimate feel and feedback. Fit Note: Ergon offers most models in 2 sizes: Small and Large. The Small and Large label refers to how thick or thin the grip is. There is no difference in the length or ‘wing' size between the Small and Large. The small grip is best for riders with small hands, those wearing thick padded gloves, and riders riding/racing technical mountain bike terrain. The large grip is best for riders with large hands, commuting, and city riding. They feel like a dream on my flat bar commuter. Nothing to not like. They look good and feel good. All commuter bikes should come out of the factory with these. If you're like me and find that flat bars give you a pain the wrist, these are for you. I've got 3 kinds of Ergon grips for 3 different bikes, and they all give my wrists the support they need on a flat and cruiser handlebars. I've tried other cheaper grips that look similar to these, but they don't do the job. I'm just a happy, comfortable dork. I've cycled for 35 years and have always been a traditionalist. I've steered clear of gadgety grips with wings and such, deeming them pointless, not to mention totally dorky looking. BUT - I just threw a pair on an electric bike I'm putting together for around town kind of stuff. Wow! These are awesome! You've got the same amount of pressure spread over three times the surface area. They are very comfortable and there is no penalty for this on an around town bike. I have small hands for a guy and the larges feel great to me. I don't wish I'd gone for the smalls, as I had feared. $40 for this big of a comfort difference is money well spent in my book. Confortable and no more numbness. Very comfortable and no more numbess of fingers on long rides.easy to install and strong clamping so no twisted grips. Nice grips! Reduces hand fatigue! Great grips for the price! My hands haven't gone numb since I switched to them. I recommend these grips for all the cyclists changing their road bike setup from a road bike handlebar to a straight hybrid handlebar. They are comfortable and decrease hand numbness, and tingling. 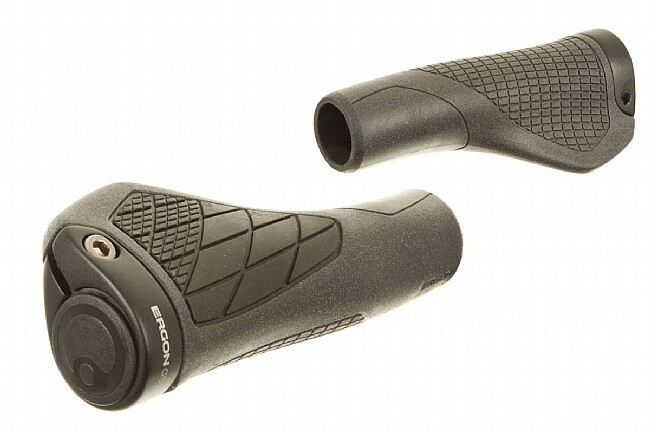 These grips are a terrific upgrade for any hybrid with traditional mountain bike grips. Much more comfortable than round grips, the Ergon's stay put. Highly recommend, especially if you can catch them on sale. Great product, comfortable, sturdy grip. I got the large size, I am slim and stand at 5'8. It was comfortable and the palm rested comfortably on the grip. I had no issues with the bold stripping. Excellent buy! !